Pastor Miguel preached recently about the importance of Scripture. I mean, that wasn’t the topic of his sermon, but he definitely mentioned it. 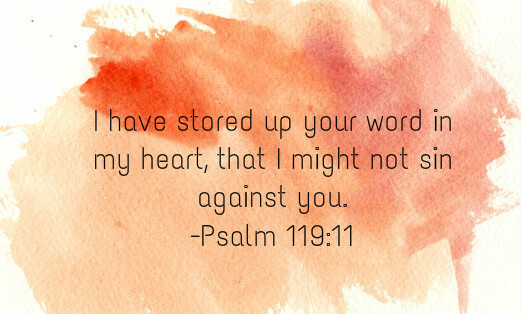 He reminded us of how important it is to hide God’s word in our hearts. You might read the Bible today and it might not speak to you, he said. You might not need that passage or that verse or that lesson today, he acknowledged. But if you don’t get it into your heart and your mind right now, it won’t be there later when you do need it, he proclaimed. In 8th grade we watched a video of a woman giving birth in our Health and Life Skills class. For years afterwards I was dead set on never doing that. 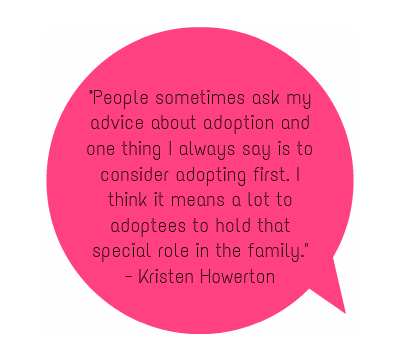 I decided then and there in 8th grade that adoption was the way for me because there was no way I was giving birth. I mean, have you seen a live birth? Have you seen a live birth as a thirteen year old? Kind of scarring. Over the years I’ve grown to love the whole wonderful, beautiful mystery that is pregnancy and birth. Pregnant woman are just so darn beautiful all full of life and strength. The fact that a human being grows within a woman and then is delivered to life through her body just blows my mind. Women are so strong. Our bodies are amazing. So I came around to the idea of birthing children and as my friends started posting cute little pregnancy announcements on their Facebook I started daydreaming about the day when I could announce my own pregnancy, hire my own doula, and birth my own children all natural and strong and beautiful. But the desire to adopt was planted in my heart back in 8th grade and has never left. So even though I’m completely single and who knows how many years out from motherhood (she says in faith – I will be a mother one day) I’ve been thinking about adoption. Particularly adoption first, white savior complex, and where the two meet – international adoption. I’ve been thinking about biological children, as well, as a teacher and as a 20-something seeing new pregnancy announcements on Facebook every day. I’ve been thinking about how casually and frequently people create humans and bring them into the world. I’ve been thinking about why we have children and why we should have children. Which gets me to thinking about why on earth a couple would spend thousands of dollars on international adoption when there are family-less children right there in their own city. I’ve been thinking about how much more cost effective it would be to adopt domestically and take the money you would’ve spent on that flight to Vietnam or Kenya and invest that in those on the ground working in community development and education. I’m thinking about how for years I was dead set on marrying a black guy so people would know I was serious about social justice. Which all gets me to thinking about all the times God reminds me that I’m only in charge of what He’s asked me to do. I’m thinking about a story from Scripture I hid in my heart a long time ago for such a time as this. A story about a woman who poured out her expensive oil on Jesus’s feet and wiped it up with her hair. I’m thinking about the disciple’s reaction. Judas thought that she should’ve sold the oil and put the money towards community development and education on the ground. Or something. I’m thinking about how Jesus said they missed the whole darn point. I’m thinking about how often I miss the whole darn point and let other people’s choices take my eyes off Jesus. I’m thinking about how we need each other to call out truth and also fill in the blanks on the why. I’m thinking about yesterday when I said, “I don’t get why apartment-owners care if dogs live in their apartments,” and my friends gave a couple solid reasons and I said, “Oh, yeah, that makes sense.” Because we need each other. I’m thinking about the value in conversations and questions and relationships that make it all stick. I’m thinking about living every facet of life with intentionality, prayer, and the Bible. I’m thinking about how important it is that I think and ask questions nobody else is asking and sometimes ask questions that everyone else is asking, but to remember that the only person I’m responsible for is me. And that I can really only know what He has asked of me. Perhaps it doesn’t make sense to me to spend thousands of dollars to fly around the world to adopt a child when there are children in need of adoption five miles away, but here’s some good news for me – God has not asked me to spend thousands of dollars to fly around the world to adopt a child so I don’t really have to worry about someone else’s why. What I will worry about is what I’m doing with my expensive oils, with my valuables, and whether or not I’m missing the whole darn point. And I’ll prep my heart and my mind and my home for children in any way God gives them to me. That’s what I’m thinking about lately.